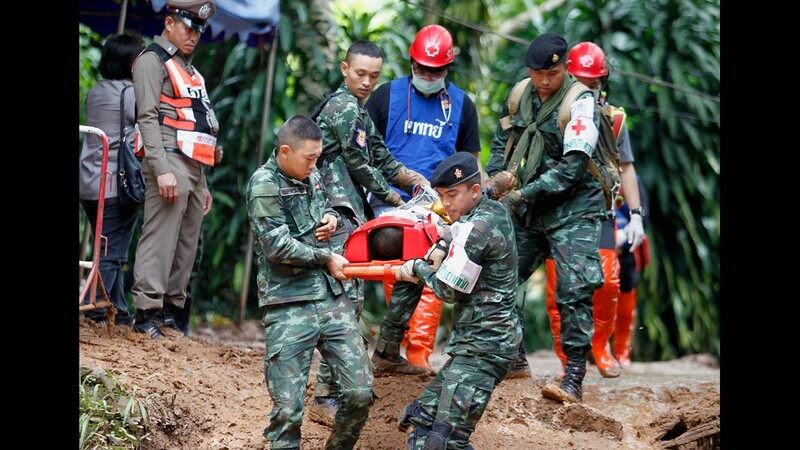 An ambulance believed to be carrying one of the rescued boys from the flooded cave heads to the hospital in Chiang Rai as divers evacuated the remaining boys and their coach trapped at Tham Luang cave in the Mae Sai district of Chiang Rai province, northern Thailand, Tuesday. MAE SAI, Thailand – The last four boys and their coach were freed from a cave in northern Thailand on Tuesday, the third day of a harrowing and heroic rescue operation that brought the young Wild Boars footballers out of a winding, flooded cavern where they were trapped for more than two weeks. "Twelve wild boars and coach are out of the cave. Everyone safe," the Thai navy SEALs, who led the rescue effort, posted on Facebook. "Hooyah." Calling the rescue effort “17 days that will be remembered forever,” acting Chiang Rai Gov. Narongsak Osottanakorn announced that all members of the team, as well as three SEALs and a medic who were staying with them, had safely left the cave and were healthy. “We did what no one ever thought we could do,” he said. “This was a mission impossible that we have accomplished." 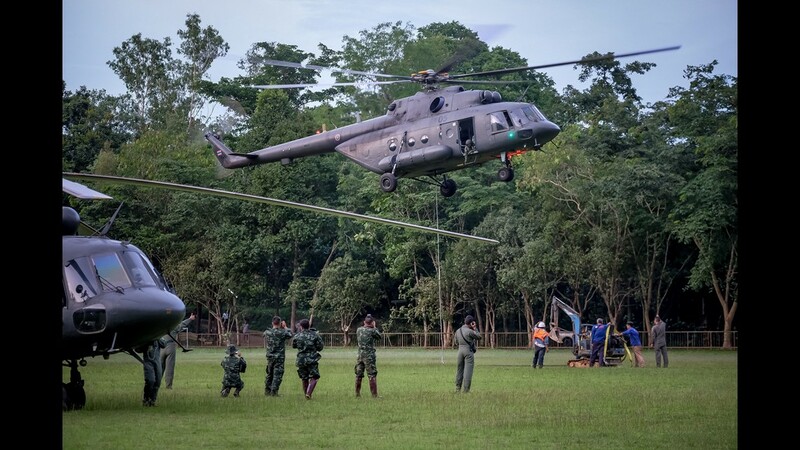 Narongsak credited the teamwork of all the local and international rescue personnel, volunteers and agencies that took part in the massive operation and said there was a lesson to be learned for Thailand and the world. The first four boys were removed from the cave Sunday. Four more were extracted Monday. All the rescued boys and their coach were taken to a hospital in the nearby city of Chiang Rai. Jubilation swept through the area as news of the final evacuations spread. Roaring cheers greeted the helicopters flying overhead carrying the kids and their coach to a hospital 35 miles away. Others said they appreciated how the rescue effort brought so many people together to help, both locally and from all over the globe. 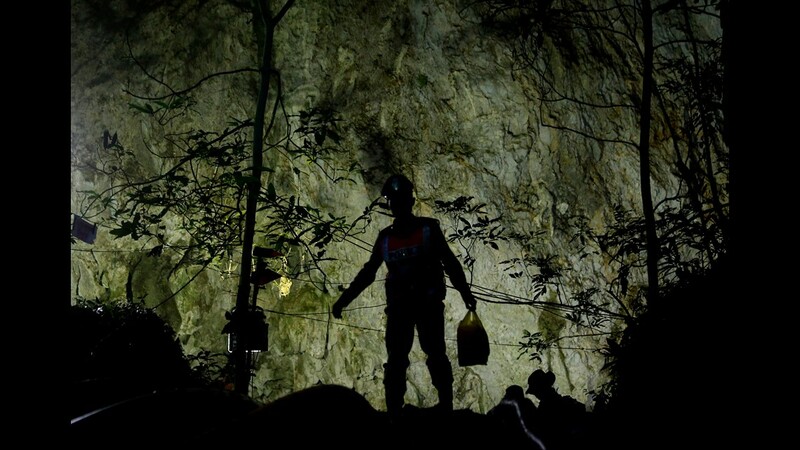 Thai officials carry oxygen tanks through a cave complex during a rescue operation for a missing soccer team at the Tham Luang cave in Chiang Rai, Thailand, July 1, 2018. 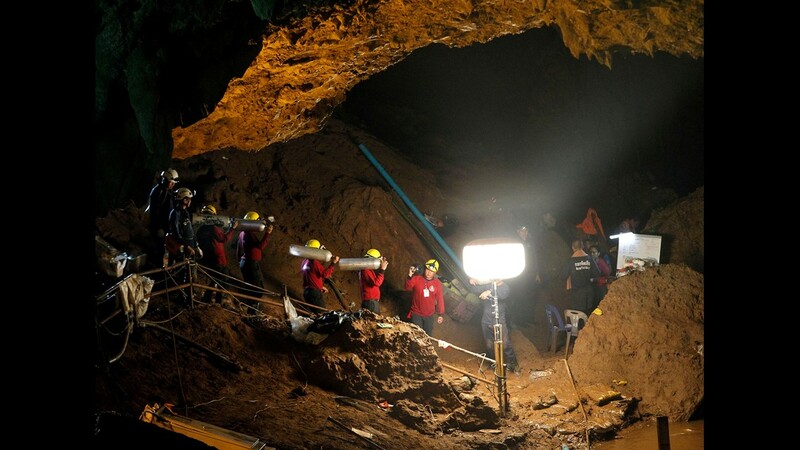 Rescuers in northern Thailand looked for alternative ways into a flooded cave as they continued the search for 12 boys and their soccer coach who have been missing in Tham Luang Nang Non cave after monsoon rains blocked the main entrance. U.S. 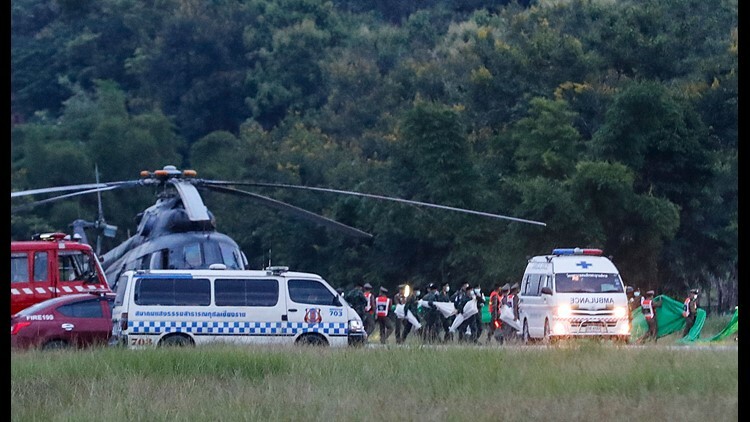 Forces and British divers joined the search as they worked their way through submerged passageways in the sprawling underground caverns as the search intensifies for the young soccer team, aged between 11 to 16, and their their 25-year-old coach. 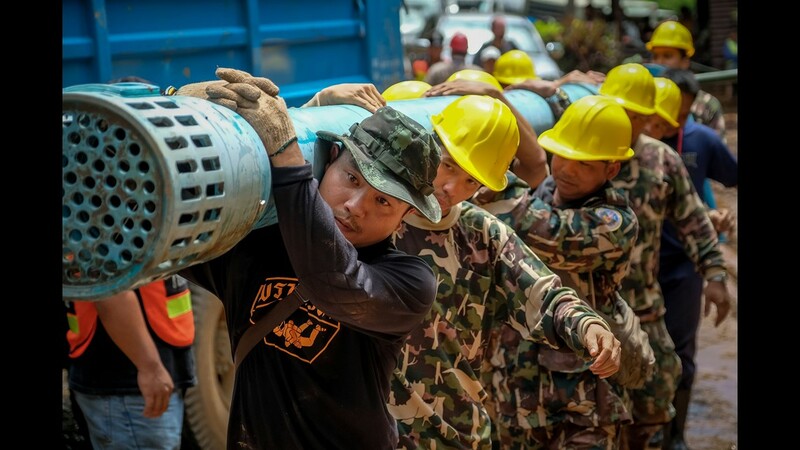 Rescue workers carry heavy water pumping equipments into Tham Luang Nang Non cave on July 1, 2018 in Chiang Rai, Thailand. 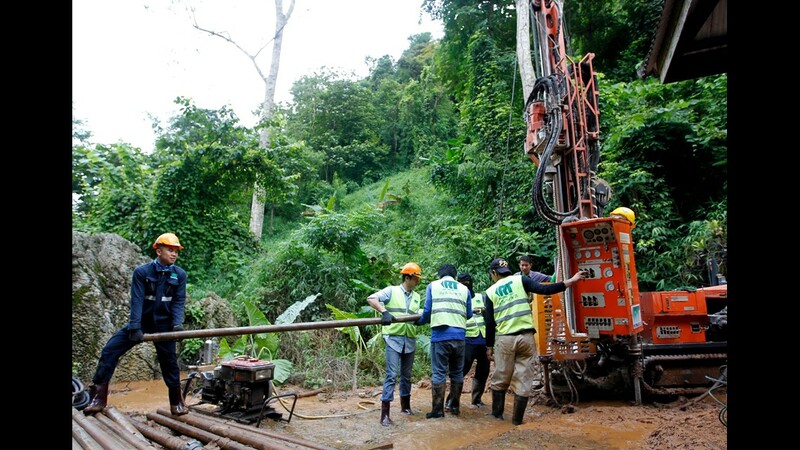 Thai workers use drilling machinery equipment in an attempt to drain the water from the flooded cave during a search and rescue operation for missing soccer players and their coach in Chiang Rai province, Thailand, July 1, 2018. 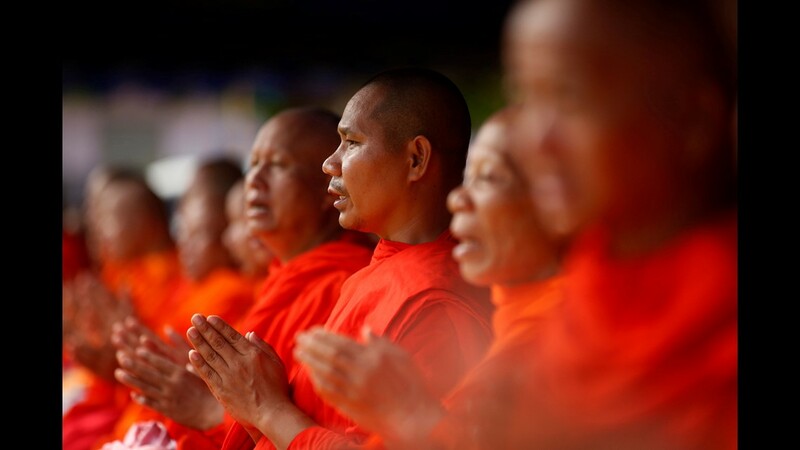 Buddhist monks pray for 12 boys and their soccer coach that went missing, in Mae Sai, Chiang Rai province, in northern Thailand, Sunday, July 1, 2018. A helicopter from Thailand's air force picks up a mini excavator to take to the mountain top where they are trying to make a hole to get into Tham Luang Nang Non cave on July 01, 2018 in Chiang Rai, Thailand. Rescuers make their way down at the entrance to a cave complex where 12 boys and their soccer coach went missing, in Mae Sai, Chiang Rai province, in northern Thailand, Sunday, July 1, 2018. Thai military medical personnel and associated officials practice carrying an injured person during an emergency exercise near the Tham Luang cave in Tham Luang Khun Nam Nang Noon Forest Park in Chiang Rai province, Thailand, on June 30, 2018. 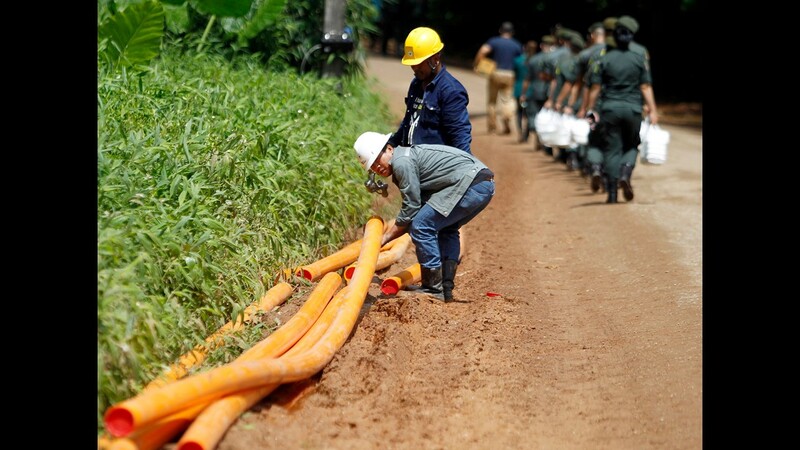 Thai workers prepare pipes for an attempt to drain water from a flooded cave during a search and rescue operation for missing soccer players and their coach at the Tham Luang cave in Tham Luang Khun Nam Nang Noon Forest Park in Chiang Rai province, Thailand, July 1, 2018. Prime Minister Prayut Chan-o-cha tamped down buzz that the boys had been drugged for the journey out of the cave. "Who the hell would give that to a kid?" he told the Bangkok Post. He then acknowledged that the boys were given "something to make them not too nervous and panic." Torrential rain fell overnight and through the morning in the area of the Tham Luang cave complex, where the Wild Boars youth soccer team had been stranded on June 23. Some players and an assistant coach were exploring the caves when heavy rains flooded parts of the vast cave, trapping them more than two miles from the entrance. Rescuers had been racing against time because monsoon rains were expected to kick up this week. Nineteen rescue divers were taking part in the operation Tuesday, which had been expected to move more quickly than in the previous two days. It took 11 hours on Sunday to retrieve the first four boys, and nine hours to retrieve another four on Monday. The first four boys, ages 14-16, had low body temperatures and two were diagnosed with lung infections, Jesada Chokdamrongsuk, Thailand's permanent secretary for health, told reporters at Chiang Rai Prachanukroh Hospital, according to the Bangkok Post. The second group of four rescued Monday, 12-14, also had low body temperatures and one had an irregular heartbeat, but by Tuesday morning all four boys were normal, Jesada said. The rescued boys are still being held in quarantine while lab tests are being done and have not been able to have direct contact with their parents yet. Parents of the first group of four were able to meet their children through a glass partition, Jesada said. It could be at least seven days before they can be released from hospital, Jesada told reporters. Postcards, letters and drawings from around Thailand have been pouring into a local government office near the cave that is being used as the media and volunteer center. “I don’t care which team wins the World Cup — the only team I follow is our Wild Boars,” one read. SpaceX and Tesla chief executive Elon Musk said he went to the cave with a miniature submarine to try and help the boys. "Just returned from Cave 3. Mini-sub is ready if needed. It is made of rocket parts & named Wild Boar after kids’ soccer team. Leaving here in case it may be useful in the future," he tweeted Monday.